It’s 5 o'clock. The kids are hungry and you have no dinner plan. Put on your apron, get out the frying pan, and let these top recipe apps help you create a last-minute meal the whole family will enjoy. From the popular site, Epicurious.com, comes the Epicurious Recipes and Shopping List app filled with over 30,000 recipes from renowned resources such as Bon Appetit, Gourmet, Self and professional chefs. With this app, it’s hard not to find a mouthwatering last-minute meal. Search by category on the home screen, with options that include healthy lunches, kid-friendly mains, I can barely cook and changing seasonal themes. If you’re looking for something specific, use the search function where you can filter recipes based on ingredients you have, dish type, dietary consideration and more. Read reviews from others to find out how they liked the dish and any tweaks you might want to consider when cooking. Recipes can be saved to your favorites and for $2 you can sync your recipe box so your favorites will show on your devices and online. 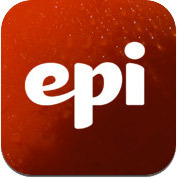 The Epicurious Recipes app is available for free in iTunes for the iPhone and iPad and in Google Play for Android devices. Is your kitchen full of natural and organic foods? If the answer is yes, you’ll want the Whole Foods Market Recipe app to help you plan your next meal. Full of healthy meal ideas, you can filter your searches according to the course you are cooking and the special diet needs of your family including gluten free, vegetarian, dairy free and fat free. There are also categories options which include cooking with kids, one pot meals and quick and easy. If that’s not enough, you can enter up to three ingredients you have on hand to find a recipe. Search results indicate if the recipe falls under a special diet category so you don’t have to guess, and you can easily add ingredients to your shopping list for the next time you are grocery shopping. The Whole Foods Market Recipe app is available for free in iTunes for the iPhone and iPad. With over 250,000 recipes in the Big Oven recipes app, you should always have an answer to the what’s-for-dinner question. Search recipes by collections, which include quick and easy, party and brunch, or upgrade to the pro version for $20 a year to get access to more collections, including vegetarian, nut free, diary free and Paleo. Full meal menu recipes are also available under categories of popular, cuisine, diet, season, holiday and weather. Each one of those categories has subcategories, so you never again have to plan a full menu yourself. If you create a free Big Oven account you can upload your own recipes and see recipes that friends have shared. If you have time, add recipes to the menu-planning calendar. The Big Oven 250,000+ Recipes app is available for free in iTunes for the iPhone, iPod Touch and iPad and in Google Play for Android devices. New York Times columnist and best-selling author Mark Bittman turned his cookbook, How to Cook Everything, into an app that anyone can use. The How to Cook Everything app features 2,000 recipes along with how-to illustrations for various kitchen tasks, including how to crush and peel garlic and how to use a chef’s knife. No Wi-Fi connection is needed to search through the recipes, so you can use this app virtually anywhere. There are timers built into the recipes so you don’t burn the meal, and you can print recipes and shopping lists, making your dinner planning even easier. Don’t eat meat? 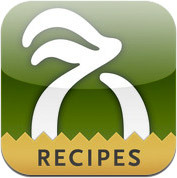 Check out the Vegetarian How to Cook Everything App which makes finding meatless meals a cinch. 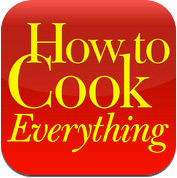 The How to Cook Everything and the Vegetarian How to Cook Everything apps are available for $10 in iTunes for the iPhone and iPad. Foodily is not your ordinary recipe app. It’s the place where food, friends and beautiful photography combine to help you put a delicious meal on the table. Follow your favorite chefs including Cat Cora and Wolfgang Puck to see recipes they have shared. Or you can search for recipes by keywords, diets, health, method and even sources such as blogs, magazines and newspapers. Once you find recipes you want to try, favorite them or save to lists for easy reference. Have something to say? Leave a comment on a recipe, or start a discussion to get ideas or answers to questions. Don’t have access to your phone? Log in to Foodily on the web so you can see your recipe feed. 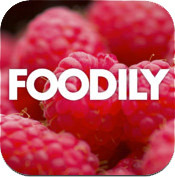 The Foodily app is available for free in iTunes for the iPhone, iPod Touch and iPad. Having a hard time deciding on a recipe? 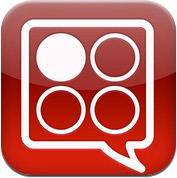 Let the AllRecipes.com Dinner Spinner app help you. You can select dish type, ingredient and/or ready in a specified time to find recipes, or you can let the spinner do it all for you by shaking your phone. Have a particular ingredient you want to use that is not in the spinner? Use the search function to find recipes and filter by dietary options such as high fiber, low fat and vegetarian. You can even scan barcodes for items in your kitchen to find recipes. Add ingredients to your shopping list straight from the app, and share recipes with your friends on Facebook, Twitter and by email. 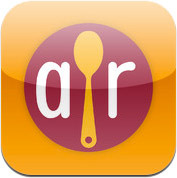 The Allrecipes.com Dinner Spinner app is available for free in iTunes for the iPhone, iPod Touch and iPad and in Google Play for Android devices.